Could be big news for implanted computers. You thought your Raspberry Pi was dinky? Try taking a look at the latest miniscule computer created by the University of Michigan – if you can even see it, that is. Wrestling the crown of smallest ever computer from engineers at IBM, the University of Michigan has created a temperature sensing computer measuring just 0.04 cubic millimeters. That makes it a tenth the size of the IBM's previous smallest-ever computer. 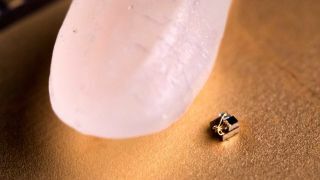 To put the size into to context, that's not a giant jellyfish in the image up top – that's actually the computer sat next to a single grain of rice. The university's researchers had to work particularly hard avoid the effect light could have on the computer. Swapping out diodes for capacitors, they had to watch out for electrical noise increases caused by the tiny size of the device, using so little power. Measuring temperature changes in extremely small areas, it's thought the computer could be used to spot the early growth of tumors, which are believed to have slightly higher temperatures than healthy tissue. However, can it truly be called a computer? Though it makes use of a processor designed around a full ARM Cortex-MO+, it is unable to maintain the data it has collected once it loses power. However, as we look for potential advances to nanotech and implantable health care, it's a stepping stone to exactly the sort of innovation that will be required.